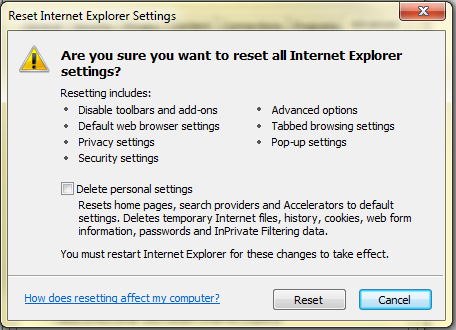 I’m using Internet Explorer 8 in Windows 7, since Beta and now windows 7 RC. But after some days of use of Windows 7 the speed of IE8 decreases. I mean the start up time and the time taken to open a new tab in IE8 increases, this makes the surfing dull. But the solution lies in the IE itself, as this is caused due to incompatible add-ons and plugins which make it run slow. You can alos update Adobe Flash Player. Further you can make it to run fast by Resetting it to default setting. For this Start the IE8 in normal mode, then go to ” Tools ” and ” Internet Options ” and select ” Advanced Tab ” and click on Reset Button which is in the bottom right corner. A new window will open to confirm the operation, here you can select Reset button and the process will start to Reset User Customization, Disable browser add-ons, and finally apply Default Settings. 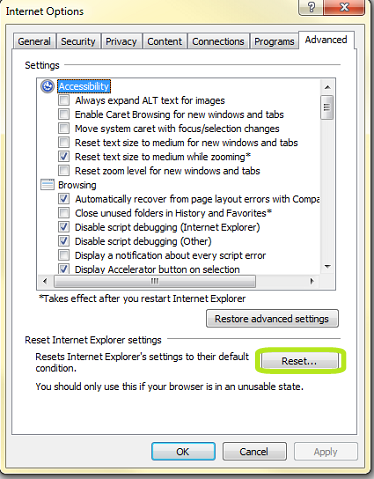 The process will take some time and finally a message will open to restart the IE8 to apply the changes to take affect. Restart the Browser and enjoy the speed.